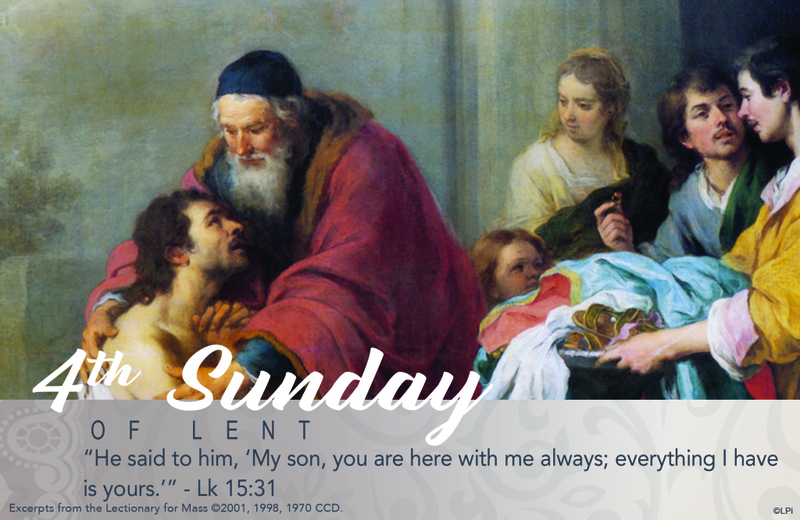 This Fourth Sunday of Lent is traditionally called “Laetare Sunday,” from the Latin meaning “to rejoice” or “to be joyful.” This is a perfect Sunday on which to proclaim this Gospel about the Prodigal Son. The father is so joyful at his son’s return home that he forgives his wanderings and squanderings and orders a feast to be prepared and celebrated. Sinners though we are, just so does our merciful Father long to embrace and celebrate with us. We have only to return to him. Expecting, hoping, anticipating minimal response from his father, the son returns home and receives lavishly from his father. The father doesn’t answer the son’s confession with words. Rather, he begins the concrete actions of showing lavish mercy and welcome. The point: Jesus’ welcome of sinners makes visible the love and mercy of God our Father, a love and mercy we all need because we all are sinful and in need of forgiveness. Forgiveness brings us to accept others (and ourselves) as weak human beings who often hurt others and cause them anguish. Forgiveness helps us to not let the past determine our choices and actions.